​At Last the Stanley Cup comes to Washington! They said it would never happen. Forty-four years after the expansion Washington Capitals began playing at the then-state-of-the-art Capital Centre in Landover (compiling a still-record-worst 8–67–5 NHL record) – and 14 years after the Caps selected Alexander Ovechkin as the Number-One pick in the NHL Entry Draft – the Boys from Ballston brought home Washington’s first major-sports championship since the Redskins won the Super Bowl 26 years earlier. After falling behind, three games to two, to the Tampa Bay Lightning in the semi-finals, the Caps roared back and earned their trip to the finals with a 4-0 Game 7 rout. Then, after dropping the first game of the finals to the Vegas Golden Knights, 6-4, they rallied to sweep the next four games, capping off the run with a 4-3 victory in Game 5. Washington captain Alexander Ovechkin (“The Great Eight”) was awarded the Conn Smythe Trophy as the most valuable player of the playoffs. Throughout this championship season, as with so many others in the past, The Washington Post Sports staff did an amazing job of covering the ups-and-downs of this championship season. Now, the Post’s reporters and editors have published Worth the Wait: The Washington Capitals' Memorable Journey to the 2018 Stanley Cup, to memorialize this championship season. Isabelle Khurshudyan covered the Capitals during their historic charge to the championship. Many of her articles are featured in Worth the Wait. 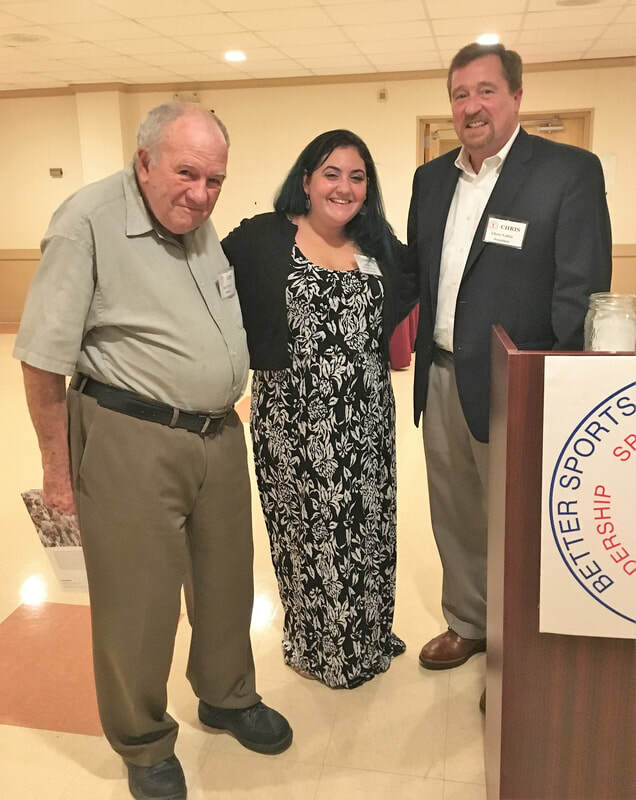 Club member, Jim Walsh (L), pictured with Khurshudyan and BSC president Chris Valtin (R), was the lucky winner of an autographed copy of the book, which was raffled at the dinner.